$12.45 on Amazon look inside this book! 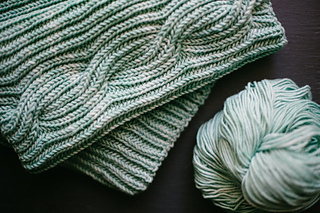 Designer Meghan Fernandes takes advantage of the bouncy, squishy structure of Jill Draper’s Hudson yarn by using it to create cables and brioche - two textures that require extra care and time to master. 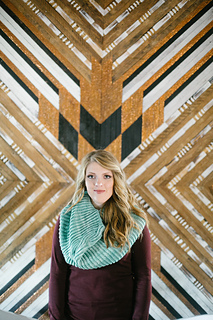 Simple but sophisticated, this cowl is a piece that can be worn season after season. The adventurous knitter will enjoy the thought that goes into working brioche in the round, as well as the satisfaction of creating double-sided cables. Wear the cowl folded double lengthwise and pulled down slightly over the tops of the shoulders for snuggly warmth. 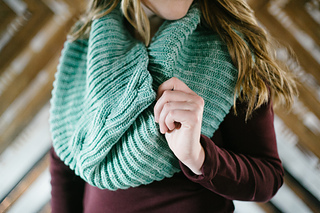 The cowl in the book is knit with colorway Spruce.